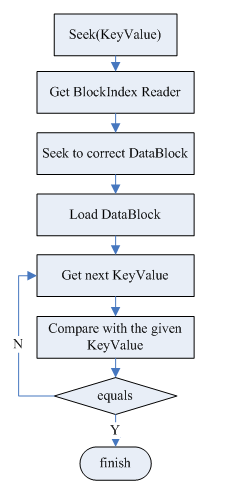 In order to have a better understanding of the below explanation, I need to explain how does a KeyValue be stored in HFile. Ø Key length = Key infrastructure size + Actual RowKey length + Actual Column family length + Actual Qualifier length. = 2 + 1 + 8 + 1 = 12. We can see, this structure was designed without storing the qualifier length. So basing on the stored value, how to calculate the qualifier length? Ø InternalScanner can get a list of KeyValues. KeyValueScanner can only get one KeyValue. 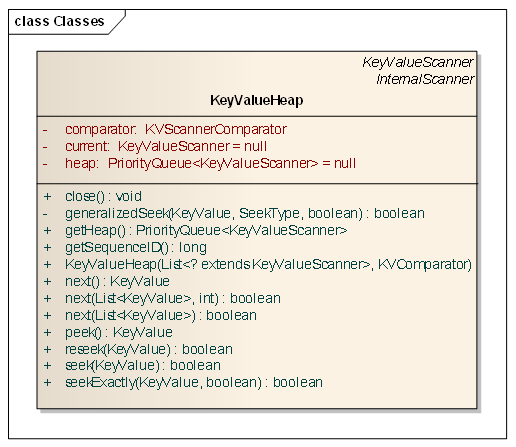 The implementation of InternalScanner is relegated to KeyValueScanner. Ø RegionScanner,StoreScanner implement the interface of InternalScanner. 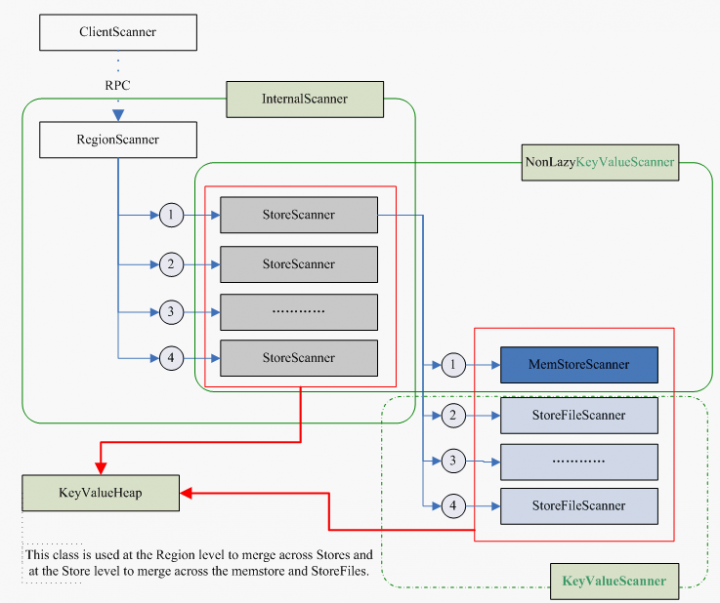 Ø StoreScanner, MemStoreScanner, StoreFileScanner implement the interface of KeyValueScanner. Definition: If one scanner A is made up by Scanner A-1, Scanner A-2, Scaner A-3, we call the scanner A as parent-Scaner, and call Scanner A-1, Scanner A-2, Scaner A-3 as child-Scaner. This definition will be used in scope of this document. There’s one member variable defined as “PriorityQueue<KeyValueScanner> heap” which used to store all the child-Scanners. Ø PriorityQueue: Poll one Scanner from this queue each time, and put back after using it(If peek to the next KeyValue of this scanner is null, the scanning is finished to this scanner. So we can close it. No need to put it back.). Which Scanner should be polled determined by the below Comparator. Ø Regarding on the peek: Just look at the next KeyValue in this Scanner, but do not iterate scanner. Switch from one StoreFileScanner to another StoreFileScanner is much easier than the above flow. Only finish one StoreFileScanner then close and switch to the next StoreFileScanenr. Ø Start a scaning with a specified startKey. We need to seek to the nearest KeyValue larger or equal with the given startKey. Ø One row or one columnFamily is totally filtered out. So seek to the next valid KeyValue. Ø KeyValueHeap: This class is used at the Region level to merge across Stores and at the Store level to merge across the memstore and StoreFiles. It is a member variable of RegionScannerImpl and StoreScanner. 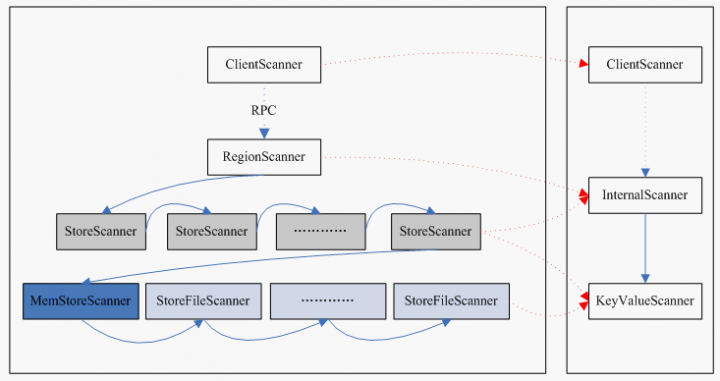 · RegionScannerImpl use KeyValueHeap to merge across Stores. 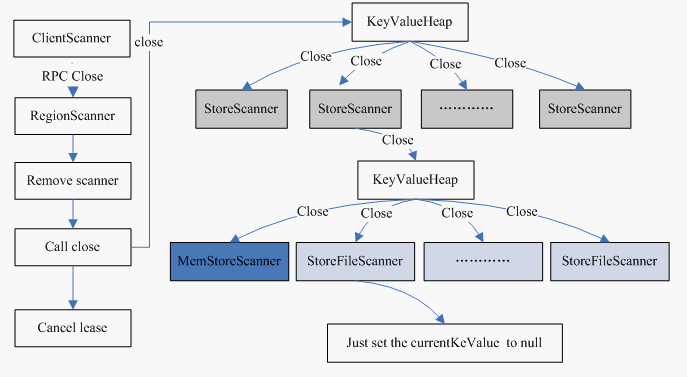 · StoreScanenr use KeyValueHeap to merge across MemStore and StoreFiles. 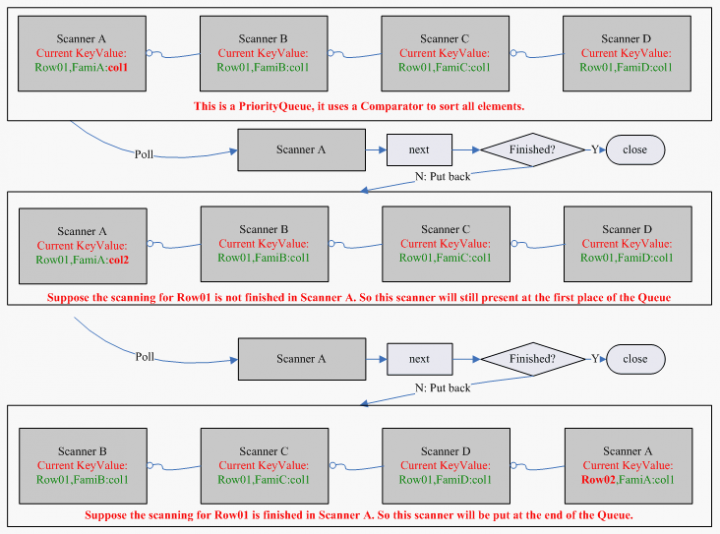 So, we can say KeyValueHeap is a parent-Scanner. It has one or more child-Scanners. During the instantiation of this class, it will load all the child-Scanners. 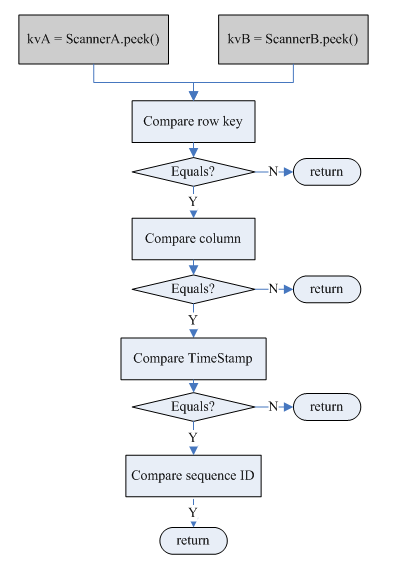 Ø KeyValueScanner: It is used to get the next KeyValue. Meanwhile, it can be used to look up the next KeyValue(Without iterate scanner), seek a KeyValue.